A recent study by Viacom of 8,000 dads across 22 countries found today’s fathers are more emotionally attached, embracing greater responsibility and investing in children’s learning than ever before. Now, we’re beginning to see this positive representation of fatherhood reflected on screen. 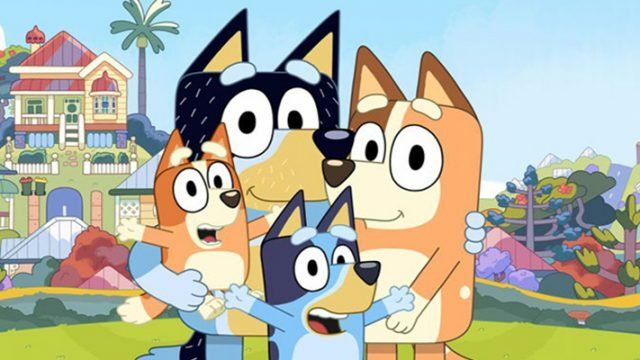 In Australia, the praise for the cartoon blue-heeler Bandit in Ludo Studio’s recent animation Bluey is a poignant example of how genuine portrayals of “modern dads” are being recognised and celebrated in kids’ TV. There’s more to look forward to in this space. Upcoming live-action, fish-out-of-water comedy, Hardball, begins this April on the ABC. With it comes a father-son relationship with a lot of heart. 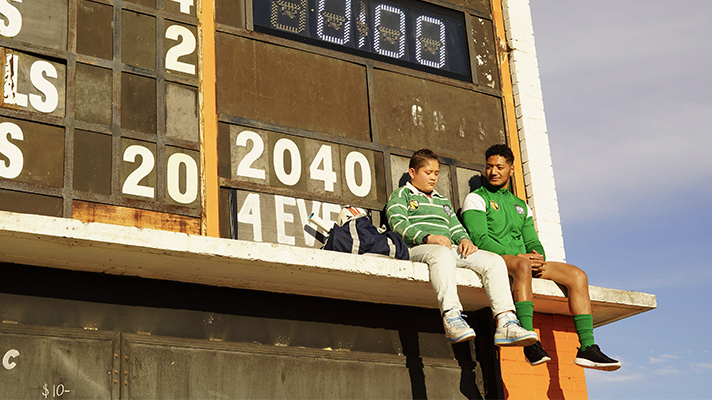 The series begins with Mikey’s daddy scoring a rugby league contract in Australia. Daddy upends their lives in New Zealand, plonking them in Western Sydney. Mikey starts at his new school mid-term and at lunchtime on day one, he discovers the ultra-competitive, schoolyard game of handball. With friends Jerry and Salwa in his corner and the support of Daddy and Auntie behind him, Mikey trains to become the resident king of the court and take home the Western Suburbs handball crown in a quest to be the best in the west. One of the most striking aspects of Hardball is that for a comedy, it has a serious edge. Among the fervour and the drama of the handball court, the series puts considerable thought into what it means to be a father today. We see this explored in the relationship between the lead character, Mikey (Semisi Cheekam) and his father, Daddy (Daya Tumua Sao-Mafiti). From the beginning of Hardball, Daddy is introduced as a warm, understanding and approachable father figure. Throughout the series, we see Daddy’s role grow as he supports Mikey’s transition to Australia, listens earnestly to the challenges of beginning at a new school and supports with pride Mikey’s journey to master the art of Handball. We also see the returning of this support in Mikey, as he embraces the move to a new country to further his father’s career. 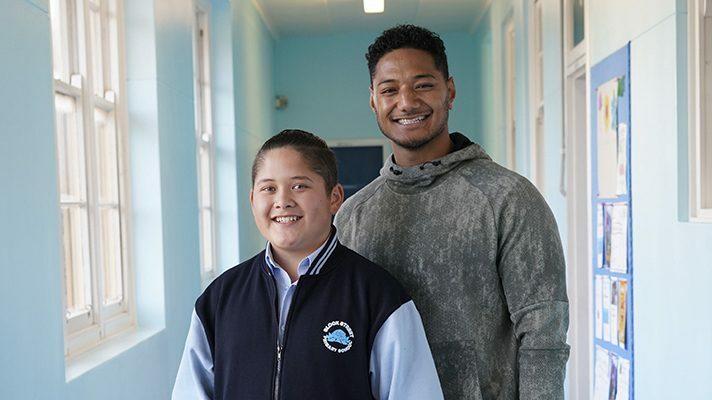 Mikey expresses joy when his Daddy is actively involved at his school, cheers his father on at each rugby game and after school, he debriefs with his father in an honest and open way. Both father and son are not afraid to ask for help when it’s needed. When the pair make the move to Australia, they rely on the support of Auntie to get their start in a new country. Mikey also learns to rely upon Salwa and Jerry’s guidance through his handball journey. In order to create a genuine dynamic in the show, creators Guy Edmonds and Matt Zeremes say they drew upon their own memories of childhood and their recent experiences of fatherhood. “There’s lots of Guy in Hardball; there’s lots of me in Hardball. There’s us as kids in there, as well as an adult perspective of fatherhood,” Zeremes says. Zeremes has three children aged eleven, nine and five and says one of the benefits in having kids is being able to road test ideas and understand the types of conversations children have with their fathers. “You listen to certain conversations [that your children] have and what happened at school and you can tap in to what the kids are up to these days,” he says. Edmonds and Zeremes recall putting the moment to paper. “When we wrote it, it was beautiful – we got goose bumps when we read it, and [again] when we saw it (on screen),” Zeremes says. A 2017 study by Nickelodeon Australia found most surveyed fathers wanted the media to more accurately reflect their involvement in household and parenting roles. In the survey, 42% agreed the media portrays dads as stupid or clueless, while 50% believed Australian media should depict dads as sensitive and nurturing by showing them interacting with their kids and enjoying activities with them. It’s moments like Mikey and Daddys’ heart-to-heart that show this representation of fathers is changing. It’s not only the positive father/son representation that Edmonds and Zeremes considered for Hardball. The creators also wanted to showcase Western Sydney and “real” families from their local community. “Western Sydney is a very diverse place – There are people from all walks of life and all different parts of the world who co-exist. We want to see [that] diversity on screen,” Edmonds says. 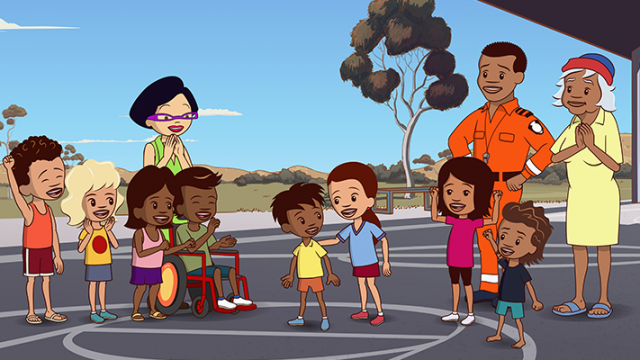 The series celebrates Australia’s many and varied cultures, interwoven with the universally relatable game of handball. “We thought ‘there’s something in handball’ because it’s a sport that pretty much any kid can play, the rules are easy to learn, and most people have a connection to it from their childhood playing it at school. “Ultimately, we wanted to create a show that doesn’t just play for kids. It needs to be a show that any family member can sit down and watch with a child and be as engaged as the kids are,” Edmonds says.